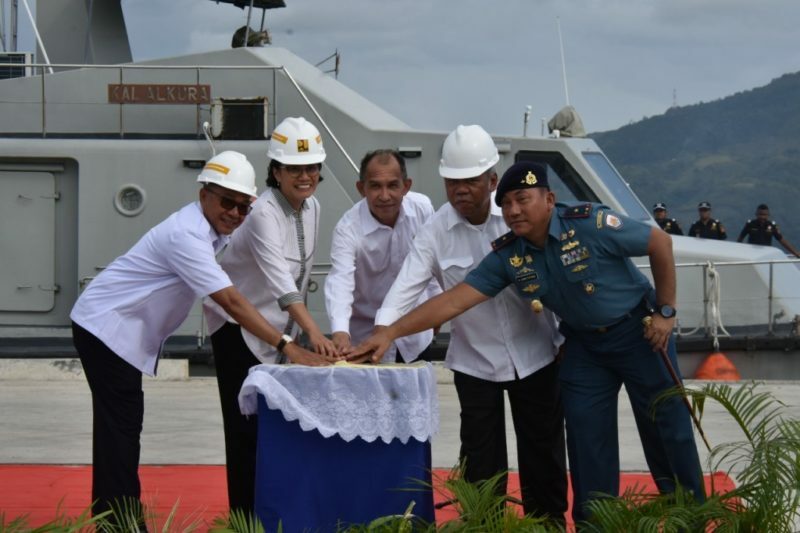 In early January, Indonesian finance minister Sri Mulyani Indrawati inaugurated the new Tawiri Ambon naval base near Ambon Bay with direct access to the Banda Sea. The base will support the navy’s major warships and be the home port of the new Third Armada’s naval combat task force. The Indonesian National Armed Forces (TNI) launched the Third Armada last year along with the Third Infantry Division of the army’s Strategic Reserve Command (KOSTRAD) in South Sulawesi, the Third Marine Force in West Papua, and the air force’s Third Operational Command in Papua. The TNI also plans to establish tri-service ‘integrated TNI units’ across Indonesia’s key strategic outer islands. The first of these units was launched in Natuna late last year, with others in Biak, Merauke, Morotai and Saumlaki—all in eastern Indonesia—soon to follow. These new commands are part of the TNI’s organisational and force restructuring towards eastern Indonesia. 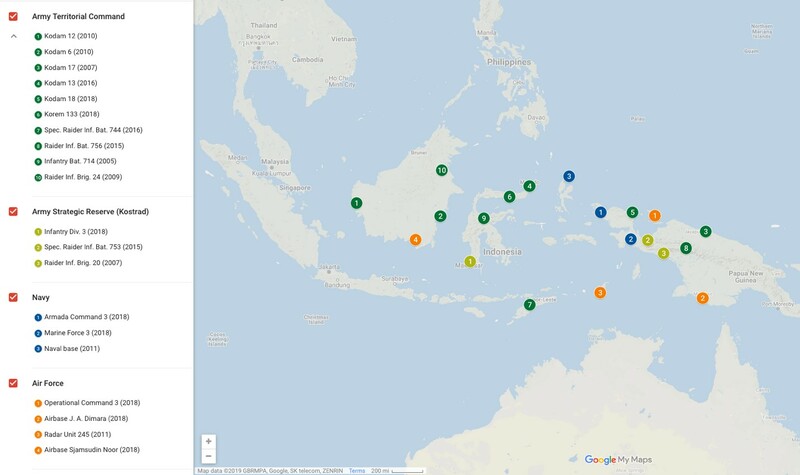 As the map below shows, the army, navy and air force have been upgrading and creating new territorial and combat units across eastern Indonesia in recent years. While the map covers only the more recent high-profile upgrades or additions, all three armed services have been gradually expanding their structures since the mid-2000s. By my count, the army has upgraded and created 60 new territorial and combat units since 2002, including territorial and KOSTRAD units and infantry battalions in Kalimantan, Papua and Sulawesi. Since 2003, the TNI has formed new and upgraded existing infantry battalions into 42 raider battalions, almost half of which are located in eastern Indonesia. The navy and air force have each upgraded and created around three dozen new units and bases since 2004, including upgrading existing bases or facilities as well as creating new units to accommodate recent arms procurements. Again, most of these activities have taken place in eastern Indonesia. The TNI plans to establish and upgrade dozens more units and bases over at least another decade. By one estimate, the TNI’s overall organisational restructuring could involve the redeployment of 25,000 to 30,000 personnel. The organisational expansion and rebalance to the east are a function of overlapping security concerns as well as internal pressures. 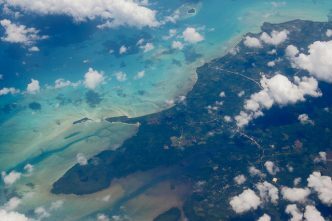 First, some defence policymakers see eastern Indonesia—from the tri-border area with Malaysia and the Philippines to the eastern corner of Papua—as the nexus of transnational security threats, border disputes and internal security challenges, including socio-religious conflicts to secessionist threats. 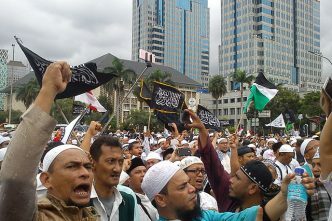 Kalimantan and the Moluccas were the centre of violent religious and ethnic conflicts between late 1990s and mid-2000s. The Ambalat dispute with Malaysia, one of the most intense territorial disputes in the post–New Order era, is off the coast of Kalimantan. Many of the key strategic outer islands are also in eastern Indonesia. Central Sulawesi was a site of intense religious–ethnic conflicts until the late 2000s. Since then, terrorism has become a prominent problem in the area. Militants and organised crime groups also engage in piracy, kidnapping and smuggling of weapons and drugs in the tri-border area. 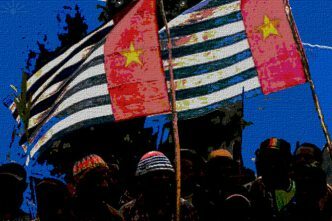 Papua is also the only area in Indonesia that continues to be plagued by separatist threats. Second, the eastern rebalance is also part of the TNI’s effort to better control and manage Indonesia’s third ‘archipelagic sea lanes’ (known as ALKI III) that facilitate navigation from the Timor Sea and Arafura Sea to the Pacific Ocean through the seas of Sawu, Banda, Seram and Maluku. How foreign naval and air forces pass through this north–south axis has been a perennial strategic concern for Indonesia’s defence policymakers. Boosting the naval and air force presence in key points along the sea lanes in eastern Indonesia is an effort to address those concerns. Third, the need to ameliorate promotional logjams—when there are too many officers but too few positions—has accelerated the organisational expansion plans to eastern Indonesia in recent years. The extraordinarily high rate of promotions—around 30 general-rank and 330 mid-rank officers (lieutenant colonels and colonels) annually between 2011 and 2017—has jumpstarted the expansion plans. Until recently, budgetary concerns, civil–military politics and arms procurement priorities have prevented the military from fulfilling the 2004 TNI law’s mandate to reorient the military’s posture towards the border area, including in eastern Indonesia. President Joko ‘Jokowi’ Widodo announced recently that the TNI will create 60 new high-ranking positions for TNI officers in the coming years. Most will be located in the new and upgraded commands and units in eastern Indonesia. Finally, for the army leadership at least, the expansion plans partly reflect the competitive relationship between the police and the military at the local level. Following the separation of the police from the military in 1999, the two security institutions have struggled to coexist given the overlap in authority in local jurisdictions. According to the National Violence Monitoring System, there were 817 incidents of military–police clashes between 1997 and 2015. Around half occurred in Sulawesi, Papua, West Papua, the Moluccas and East Nusa Tenggara. For the TNI leadership, these security concerns, organisational pressures and interagency dynamics all shape the eastern organisational rebalance of the force structure. We can debate whether these concerns are valid—or whether the rebalance is the best way to address them. For now, most of the TNI’s forces remains in western Indonesia covering the major straits and the bulk of the population and economic infrastructure. But if the expansion plans are fully realised, Indonesia is likely to be more confident in managing its regional environment. The Jokowi administration and TNI Commander Air Marshall Hadi Tjahjanto appear determined to lay as much as the foundation for the rebalance as possible. 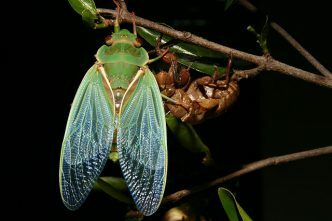 Editors’ note: Minor amendments have been made to the end of this post since it was originally published. Evan Laksmana is a senior researcher at the Centre for Strategic and International Studies in Jakarta. 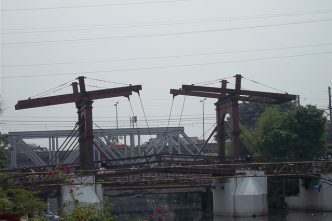 Image courtesy of the Republic of Indonesian.